Changes to clarify requirements in a proposed standard are open for public comment. 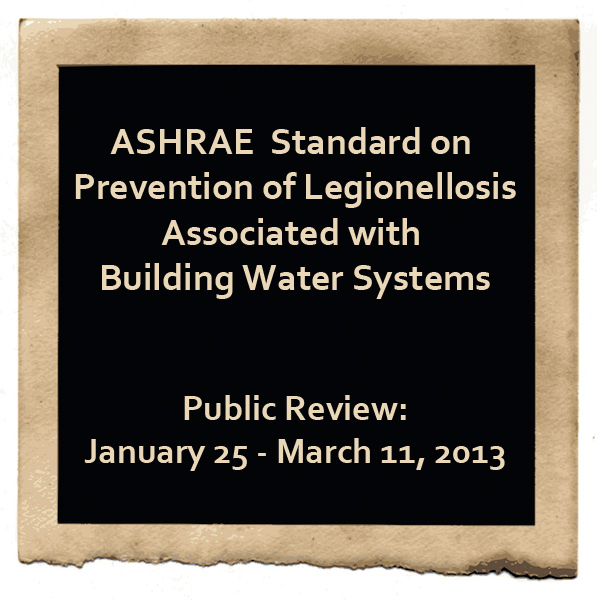 The proposed ASHRAE standard, 188P, Prevention of Legionellosis Associated with Building Water Systems, specifies what must be done to control the spread of legionellosis. The standard helps facility managers/owners understand how to apply the available information on Legionella effectively in order to prevent cases of legionellosis associated with building water systems. Compliance with the standard requires facility managers/owners to formally take responsibility for controlling Legionella in their building water systems, while at the same time acts as a defense against accusations of negligence in those cases which are caused by the hazard from unknown sources. Standard 188P also covers the potable water system in buildings, which are not treated as often as cooling towers, and will hold facility managers/owners accountable for properly managing the entire building water system both potable and utility water. The standard differs from ASHRAE Guideline 12, Minimizing the Risk of Legionellosis Associated with Building Water Systems, in that while the guideline gives recommendations about how to treat various building water systems, the standard specifies the practice of exactly what must be done with all those recommendations.